The yellow cake is a 19th century classic that is the basis for many of today’s recipes. It is light, moist, and full of vanilla flavorings. This basic cake is easy to remember (1 cup butter, 2 cups sugar, 3 cups flour, 4 eggs), simple to prepare, and foolproof, thus it was one of the first cakes taught to beginning bakers. We got this recipe out of The Perfect Cake by Susan G. Purdy. My husband is a huge fan of yellow cake, so of course he loved it. One time he bought a yellow cake mix at the store with chocolate frosting from a jar (yuck) and had me make a yellow cake and chocolate frosting the “easy” way. I personally HATE cake mixes, unless you do something to it, like the Gooey Butter Cake (Neiman Marcus Cake) or Cherry Pineapple Pecan Cobbler, also known as Dump Cake. Plain old cake mix by itself is dry, flavorless, and dry…do I have to repeat myself? Dry!! The chocolate frosting in a can is too sweet, too thick, and not creamy. After making that awful cake, I really had no desire to ever eat a yellow cake again… until we tried this recipe. My mom made it, and it was the exact opposite of the box mix you buy at the store. Flavorful, moist, buttery, and a touch of vanilla are words that describe this homemade yellow cake. This Basic 1-2-3-4 cake can be modified in many ways. You can make it an almond cake, an orange cake, a yellow cake, a chocolate cake, etc. based on the extra ingredients and modifications you use to personalize your cake. I used one of the variations in the book, the Basic Yellow Cake, and topped it with with my favorite chocolate icing recipe from The Junior League of Houston, Inc.’s cookbook, Stop and Smell the Rosemary. 1. Prepare pans (two 8 or 9-inch round cake pans or one sheet 13 x 9-inches) by spreading solid shortening all over the bottom and sides of pans, then dust evenly with flour; tap out excess flour. 3. In the large bowl of an electric mixer, beat the butter until soft and smooth. Add the sugar and beat until light and smooth. Ad egg yolks, one at a time, beating after each addition. Stop the mixer and scrape down the sides of the bowl and the beaters several times. 5. In another bowl, with a clean beater, beat the whites until stiff but not dry. Stir about 1/2 cup of whites into the batter to lighten it, then fold in remaining whites in several additions. 6. Divide the batter evenly between the pans. 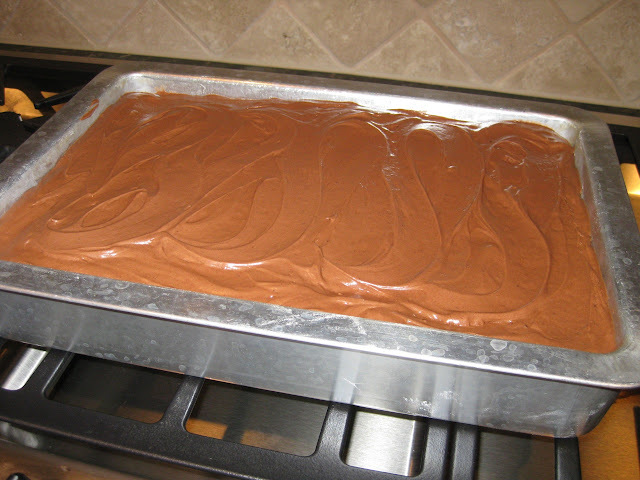 Smooth the batter level, then spread it slightly from the center toward the edges of the pan so it will rise evenly. Bake 30 to 35 minutes, or just until a cake tester comes out clean and the cake tops are lightly springy to the touch. 7. Cool the cakes in their pans on a wire rack for 10 minutes. Top with a wire rack and invert; lift off pans. Completely cool layers before frosting. Or you can leave a sheet cake in its pan to cool, and frost and serve it from the pan (which is what we did). Basic Yellow Cake: Prepare Basic 1-2-3-4 Cake but use 5 eggs; do not separate them. Add whole eggs in step 3. Increase milk to 1 1/4 cups. **Note: For the lightest texture, follow the recipe as written, separating the eggs and beating the whites stiff. For an even simpler method with just a slightly more compact texture, you can beat in whole eggs in place of the yolks, omitting the beaten whites. Mix powdered sugar, milk, vanilla, butter, coffee, cocoa, and cinnamon. Spread frosting on top of two layers, then stack layers on serving plate. Hold together with wooden toothpicks. Add third layer. Frost top and sides. (We spread the frosting on a single layer, 9 x 13-inch cake). Stop and Smell the Rosemary: Recipes and Traditions to Remember: A Cookbook by the Junior League of Houston, Inc.
2 Responses to "Basic Yellow Cake with Chocolate Frosting"
Honestly, the best yellow cake with chocolate frosting I have ever eaten….And, I have loved the yellow cake mix out of a box. (sorry) This cake was so moist, and just the right about of chocolate in the frosting, since I am not a huge fan of lots of chocolate. When are you baking this again????? ?